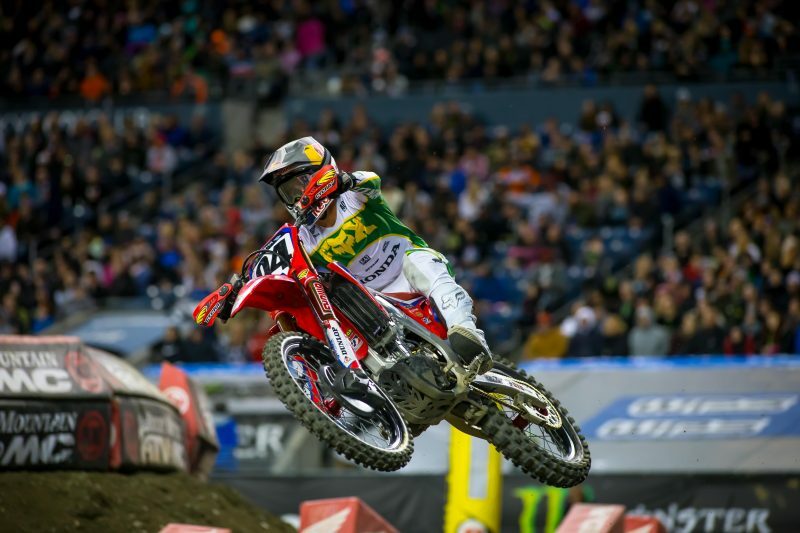 After posting top-five finishes at the first nine AMA Supercross rounds of the 2019 season, only to slip to a pair of eighth-place results at the last two races, Ken Roczen was pleased to turn in a solid second-place showing in Seattle. 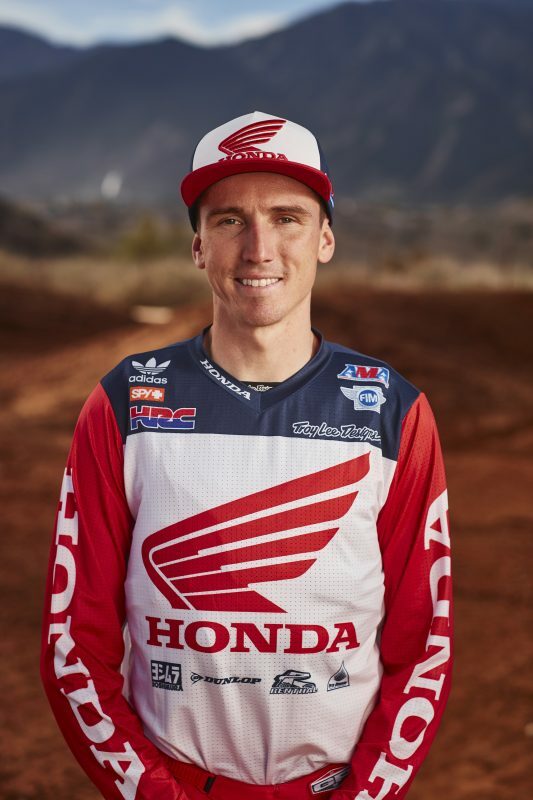 The Team Honda HRC rider started well and soon advanced to second behind Marvin Musquin, eventually finishing with a deficit of just 2.3 seconds. 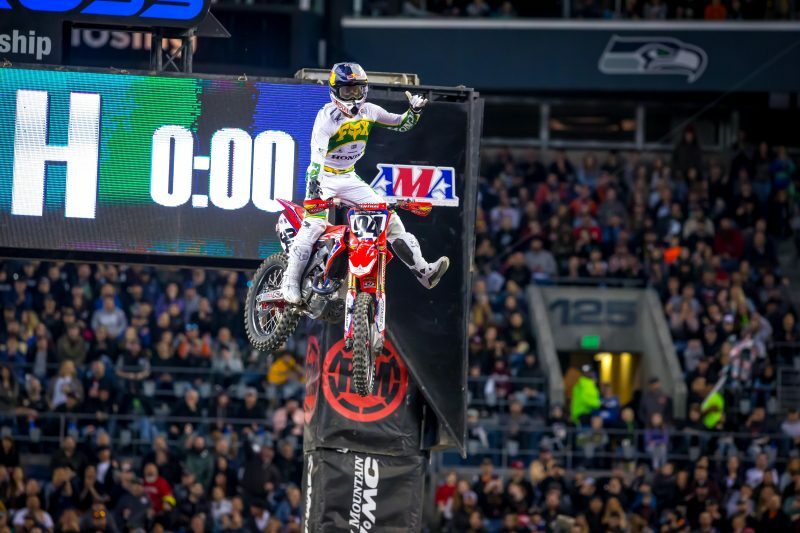 Along the way, Musquin jumped a series of jumps under a waving red-cross flag, and although he was subsequently docked seven points for the infraction, rules stipulated that he keep the win, leaving Roczen the still-inspired runner-up. Cole Seely enjoyed a strong start and ran at the leaders’ pace for the first part of the race, then slipped back as he began to tire. In the end, he finished ninth. 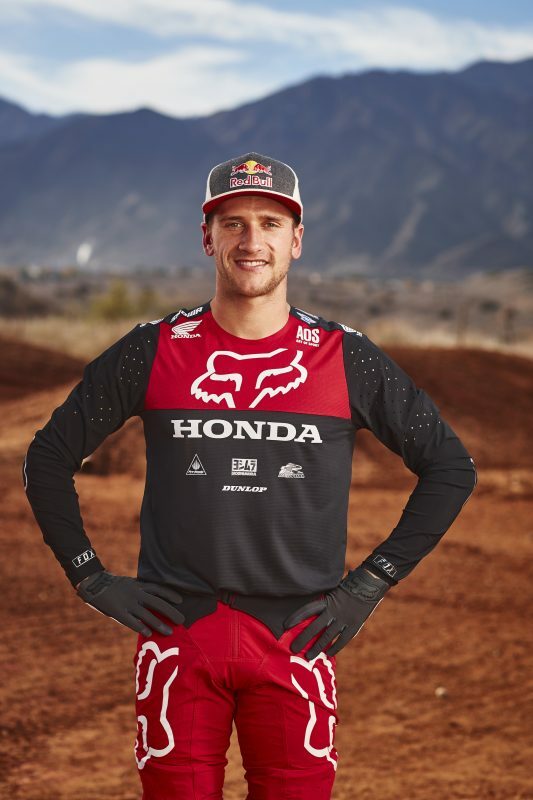 On Friday, Team Honda HRC’s Ken Roczen and Cole Seely both participated in Press Day, when they put in a couple of sessions on an abbreviated version of the track and did interviews with the attending media members. 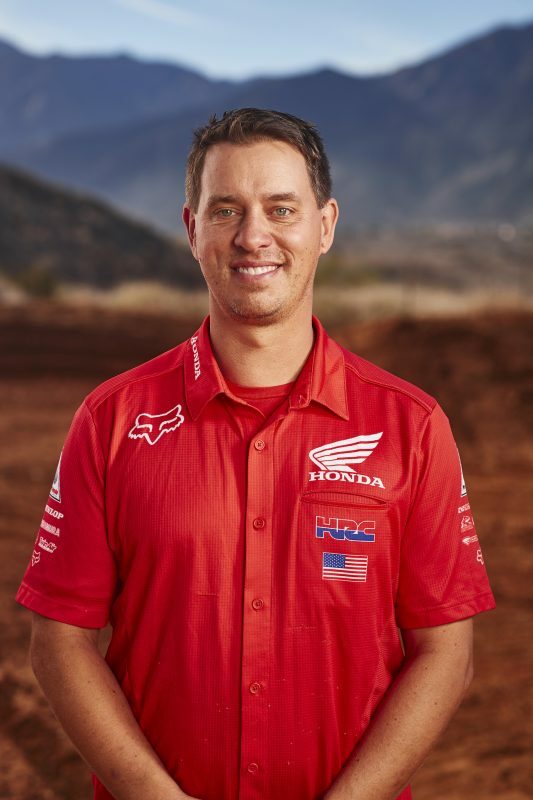 Following Press Day, Roczen and Seely braved rush-hour traffic to join GEICO Honda’s RJ Hampshire and Cameron McAdoo for an appearance at Lakewood dealership South Bound Honda, where they were greeted by a huge group of enthusiastic fans. 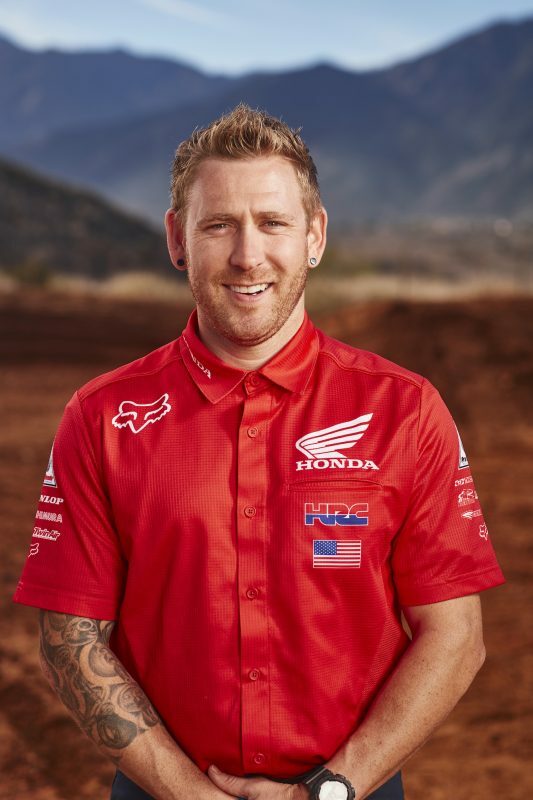 The shop went the extra mile, creating replica CRF450R and CRF250R team bikes to display each rider, and even raffling off a Roczen-replica CRF50F. 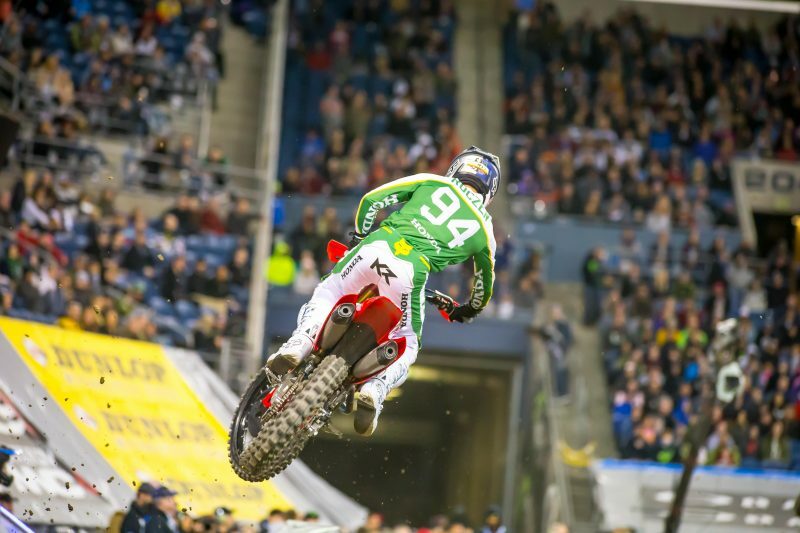 While CenturyLink Field is an open stadium, the pits there are actually located indoors, and since regulations prohibit bikes from being started in the closed space, the mechanics did a fair amount of pushing bikes back and forth through the course of the day. Seattle is known for its frequent precipitation, and gloomy weather forecasts had many worried about a repeat of last year’s muddy event. In the end however, conditions were cool but dry. 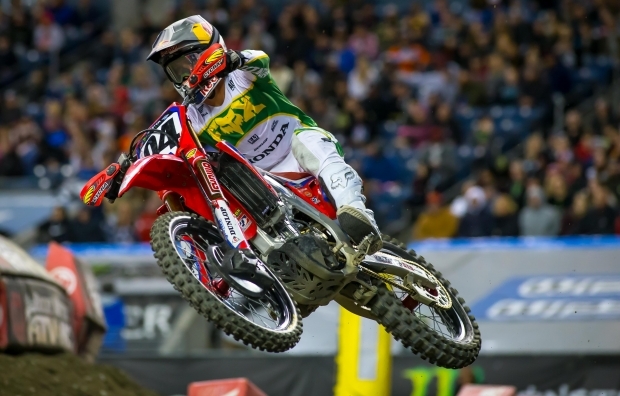 The Seattle track’s dirt contained a large quantity of rocks this year, prompting Team Honda HRC to install plastic Cycra handguards on the CRF450R race bikes of Roczen and Seely. 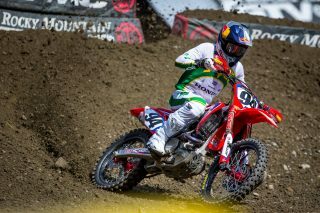 Roczen posted the fastest time during the daytime program’s first timed qualifying session, a 46.489”, while Seely was ninth at 47.379”. They slipped three and one spots, respectively, in the second session, with 45.803” and 46.415” times. 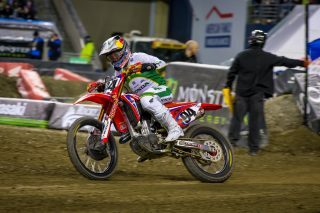 Roczen and Seely were both slotted in the first 450SX heat race, and Roczen rode great, starting in second place before passing the leader early on and riding to an impressive victory (the quicker of the two heat-race wins). 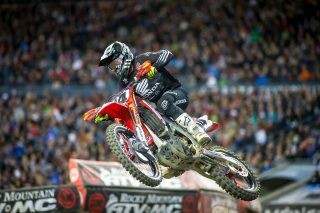 Seely ran fifth in the early going but climbed a spot to finish fourth. 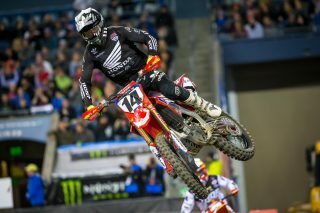 The Seattle round represented a return to the 250SX West Region following a stint in the East, which meant RJ Hampshire and Cameron McAdoo took the baton from GEICO Honda teammate Chase Sexton. 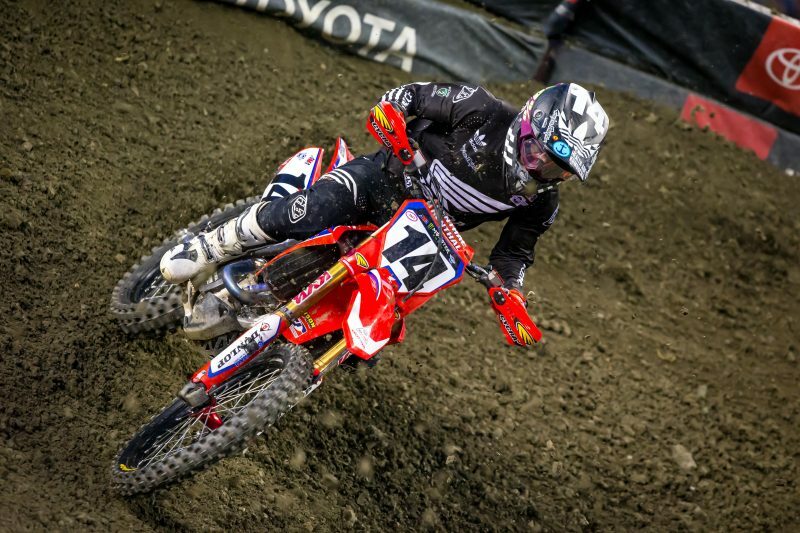 Unfortunately, the duo had a wild ride in the main event, inadvertently making contact with one another on the start straight and again in the first turn before both went down, leaving them with ground to make up. Hampshire advanced as high as the top five but ended up sixth, while McAdoo made it up to eighth. 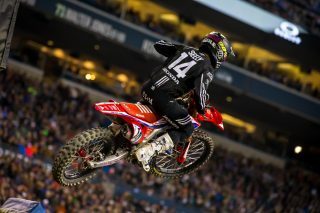 Once again, Honda had more bikes than any of the six manufacturers in the 450SX main event, with seven CRF450R race machines (31.8%). 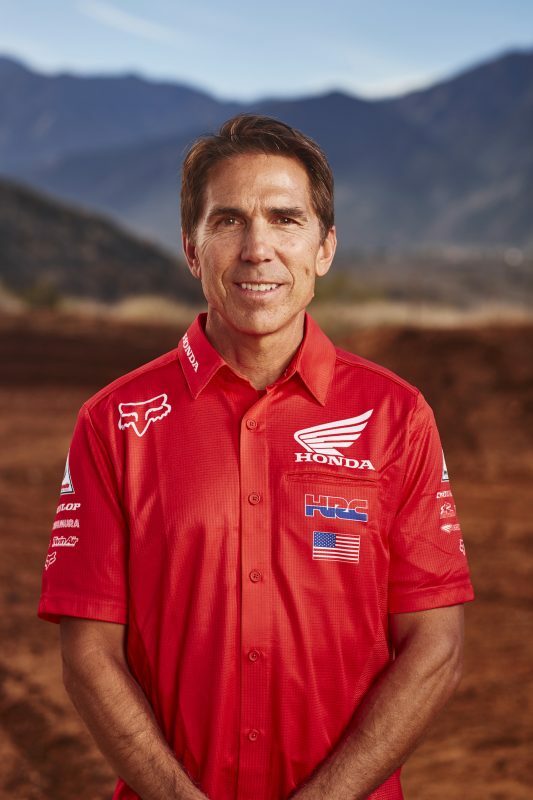 In addition to the two Team Honda HRC racers, other qualifying Red Riders included MotoConcepts’ Mike Alessi and Justin Brayton, TPJ’s Ben Lamay and Austin Politelli, and BWR’s Carlen Gardner. 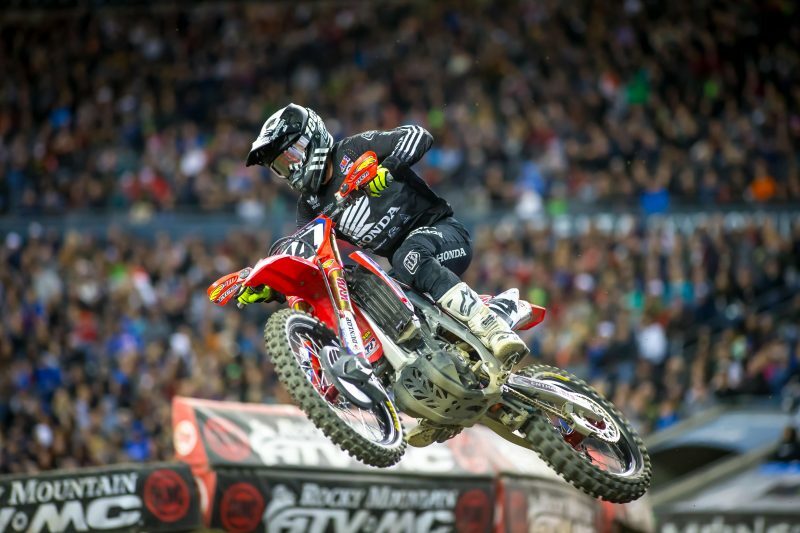 Brayton was involved in a dramatic, lap-one, multi-rider incident that saw him tumbling through the air without his bike before landing hard, leaving him with an injured left knee. 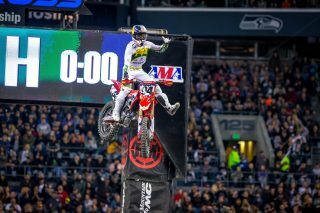 With winner Musquin being docked seven points for jumping during a red-cross flag, Roczen’s situation in the title chase improved, but only slightly since he still only received second-place points. He still sits fourth in the standings, but he’s now four points behind third-place Eli Tomac instead of six, and 23 behind leader Cooper Webb instead of 27. 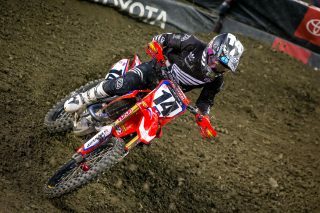 Meanwhile, Seely advanced one position, to 10th. 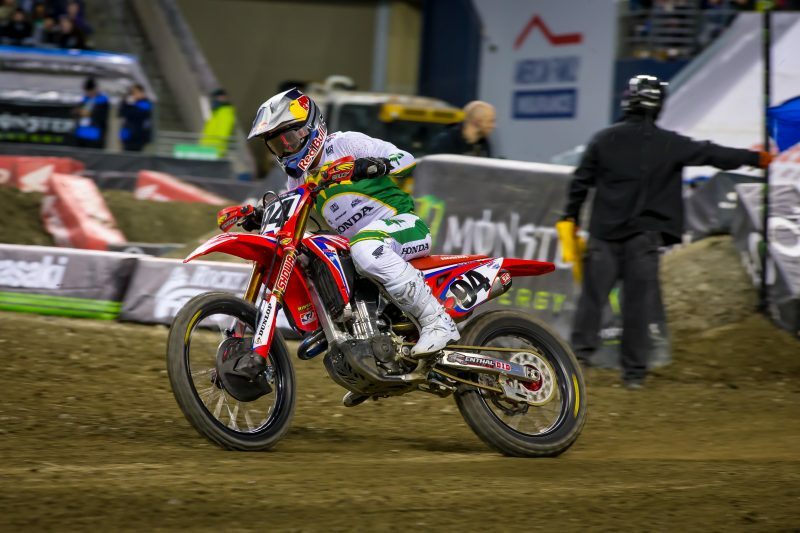 March 30 will mark the 13thstraight week of racing for AMA Supercross, with Houston playing host, and Team Honda HRC will be visiting Katy, Texas, dealership Wild West Motoplex the night before the race, beginning at 6 p.m.